Muslim Basketball (MB) is a 501(c)(3) non-profit men's basketball league conducted several times per year in New Jersey. MB is devoted to giving Muslim brothers and non-Muslim friends a chance to gather in an organized environment, build friendships with one another, pray with each other, and enjoy the game of basketball together. MB offers a high level of segmented competition of multiple divisions while maintaining organized basketball standards such as regulation-sized gyms, referees, and statskeeping. 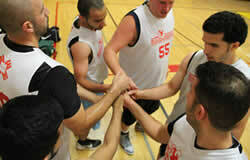 MB's main objective is to satisfy the need for a truly organized men's basketball league. Read more about Muslim Basketball in: Dribbling for Dawah, SLAMonline, NJ.com, NBC Sports (PDF), The Washington Post, Ummah Sports and Got Wudu (PDF).